Berryburst is an online slot game bursting with bright colours and comes with 5×3 reel structure, cluster mechanics, expanding wild reels and seven symbols in form of fruits. With fruits hanging loose in a fruit juice, the graphics and visual of this slot game is worth commending. However, unlike many other slot games, there are no free spins, no scatter symbols as well as bonuses, this slot game is basically centred around the wild symbols. Read along and find out more about this online slot game. The Berryburst slot game is a cluster type game with a 5×3 reel set, 7 icons make up the game including; diamonds, spades, raspberries, limes, oranges, grapes, hearts and clubs. With no free spin, no bonuses and no scatter symbols, this slot game is all about the wilds. The wilds in this slot can show up anywhere on the reels. Either in the main or the re-spins. Subsequently, when a wild lands on any reel, it expands and covers the reel it had landed on totally. This is then accompanied by a resin. However, If you land a 15 wilds symbol, you will earn a payout 500 times your initial wager while you get to earn as much as 1000 times your stake when you land on a full screen. When you arrange five to more wilds vertically or horizontally, with two symbols are placers adjacent each other, a cluster is formed. However, when 6 or more wilds come together to form a cluster, the wilds change to a symbol on either side. Therefore, the only time wilds can form a cluster with it being substituted for a symbol on the screen, the wilds fill up the screen. The wild symbol expands as it appears on one of the five reels. The highest paying symbols are raspberries and ice cubes and they offer up to 250x of your wager! When the ice cube wild expands on the reel, it gives you a free re-spin. It will lock into place for the re-spin. If another wild comes in, it will also expand and lock into place for an extra re-spin. Five fully wild reels offer wins of over 1,500 times your stake! 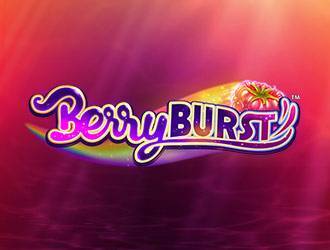 The Berryburst slot is amazing with the bright coloured fruits and refreshing ice cubes quenching your thirst of payouts all through the game.